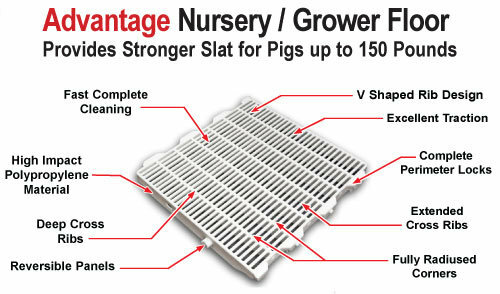 Double L's 24" x 24" FILTER-EEZE® Swine Advantage Nursery Floor provides a heavy-duty, stronger slat for pigs up to 150 lbs. The 1/4" gap around the perimeter of each Advantage Nursery Slat makes the slat easy to power wash clean and disinfect, reducing the transmission of diseases. 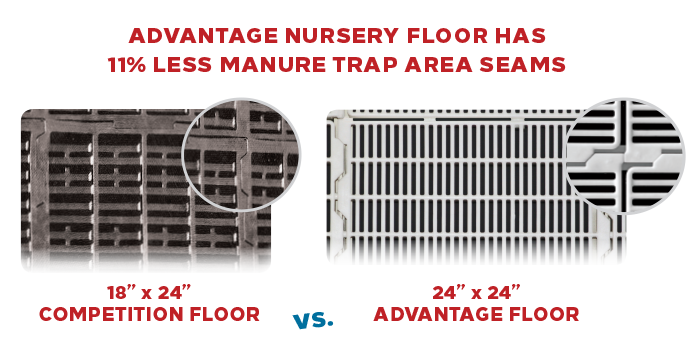 Filter-eeze® Advantage Nursery Floor has 7/16" slot openings for 50% open space manure filtration that leaves a cleaner floor to help protect pigs from bacteria-causing diseases. 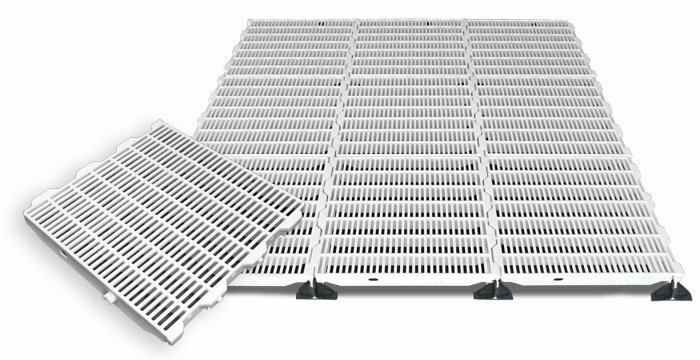 Made of rugged virgin, high impact polypropylene plastic material, Advantage Nursery Flooring has a warm surface that does not rob pigs of their body heat and reduces chilling and stress on your pigs. Its 24" x 24" design requires fewer fiberglass support beams than the 18" x 24" competition, thus also reducing the cost of installation. The Advantage Nursery Floor's solid plastic construction is rust / corrosion proof and resists bacteria build-up, shedding waste easily. The Advantage Nursery Floor has a heavy-duty design with excellent impact resistance. Double L's Advantage Floor easily snaps together for fast and easy assembly and its reversible panels make installation even easier! 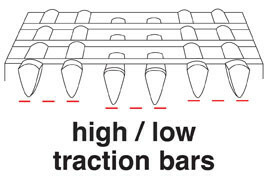 High / low superior traction bars provide excellent traction for pigs. Reinforced deep cross ribs enhance strength.